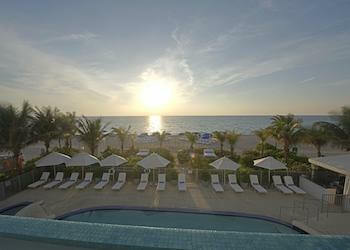 Sunny Isles Beach hotels are ideal for a quieter beach escape than the melee of South Beach. The atmosphere here is more low-key which also attracts plenty of families. Sunny Isles is located on the barrier island just north of Miami Beach. The slim sliver of land has plenty of beachfront (two-and-a-half-miles to be more precise) on the eastern side facing the Atlantic Ocean, and on the west, the Intracoastal Waterway separates it from the mainland. Despite being in the northernmost part of Miami, it is still readily accesible to the popular spots in South Beach with public transport or a short Uber ride. This area has gone through a major transformation where small quaint waterfront motels have been replaced by luxury high-rises offering fantastic facilities including golf courses, world-class spa resorts, fine dining, boutiques and marinas. Sunny Isles boasts some of the most glamorous and notable architectural projects in the city: the Porsche Design Tower which features a first-of-its-kind automobile elevator system; Jade Signature, the oceanfront condo development with its giant legacy kapok tree at the entrance; and the ultraluxe Turnberry Ocean Club Residences with an out-of-this-world three-story "Sky Club" perched 300 feet above sea level. Most everything, hotels, restaurants, shopping, are located along Collins Avenue which runs north/south and connects to Miami Beach. The area is very walkable with Starbucks, McDonalds, Publix Supermarkets and the like along Collins. At the south end of Sunny Isles is the newly redone Newport Fishing Pier, where you can cast your line, stroll for some dazzling views of the Sunny Isles coastline or just hang out at the pier Bar. South of Sunny Isles and occupying the southern tip of the islet is Haulover Park known for the clothing-optional Haulover Beach. On the opposite direction to the north are the Broward County beaches, Hollywood Beach and Ft. Lauderdale Beach. Sunny Isles is also convenient if you are cruising out of Port Everglades as it is at the mid-way point between South Beach and the Port. And if you are into heavy-duty shopping, some of the best luxury and designer shopping in Miami is a stone-throw from Sunny Isles at the upscale Aventura Mall, just accross the Intracoastal, and Bal Harbour Shops just south of Sunny Isles. There is even a FREE shuttle to take you to both offered by the city. Sunny Isles is only 10 miles away from the Art Deco District and Ocean Drive and even if you don't have a car, convenient bus connections run frequently along Collins Avenue to bring you to the center of the action. With Bus Route 120 Beach Max it is a straight shot from Sunny Isles to South Beach, passing through Haulover Beach, Surfside, North Beach and Miami Beach. Here's more on Bus Route 120 Beach Max, map, stops and schedules. 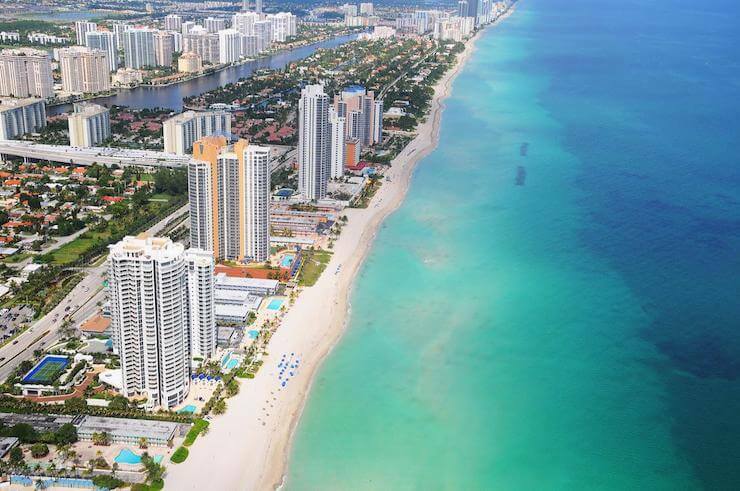 The City of Sunny Isles also provides a FREE shuttle which makes it easy to get around within the small town and connect to three neighboring cities: Aventura, Hallandale, and North Miami Beach. Here's more on the FREE SIB Community Shuttle, map, stops and schedules. Accomodations in Sunny Isles offer a great range of options from luxury waterfront resorts to basic and convenient accomodations and apartments and vacation rentals. If splurging, waterfront hotels with direct beach access are the ultimate for the beach-holiday seeker. 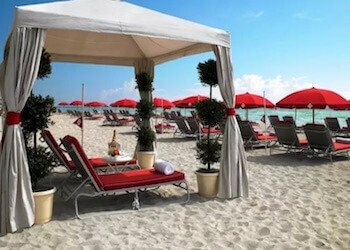 For pampering of a high order, the Acqualina Resort & Spa gets top marks. Hotels located a short walk from the beach in many cases also offer fantastic ocean and intracoastal views and are good compromise. The Residence Inn Miami Marriott is a top choice. Beach access is through the many access paths spread out every other block or so, inquire at the front desk as to the nearest crossing. There is no shortage of apartments and vacation rentals in Sunny Isles offered by private owners or via agents and management companies. Experiences vary greatly, even for properties in the same building, so be very cautious when hiring a rental, do it through reputable sources and read recent reviews. Please be aware of the many extra fees you may encounter and check what is included in your quoted rate. Many hotels charge a "Resort Fee" which can run from $20 - $40 per day extra. Parking and valet services can tack on an extra $25-$38 per day. Cleaning fees in the case of apartments and rentals are billed per stay, $100 - $150 so consider this if only staying for a couple of days. ›› Doubletree Resort & Spa by Hilton Ocean Point is a member of Hilton Honors, use/earn HHonors Points! 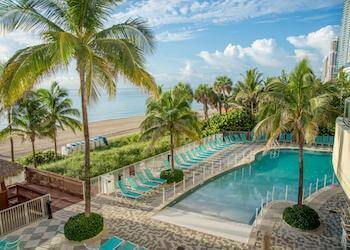 This upscale family-friendly beachfront resort boasts private beach access, a luxury spa, a gourmet restaurant, and rooms with gorgeous views. 356 spacious guest rooms, studios, junior suites and one- and two-bedroom suites with stunning views of the Atlantic Ocean or the Intracoastal Waterway. Rooms are spacious and all offer marble bathrooms and a private balcony. 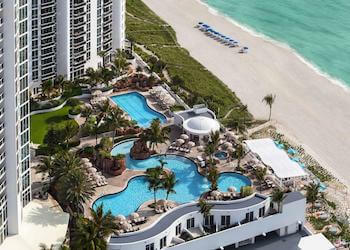 ›› Trump International Resort Sunny Isles is a member of the Preferred Hotel Group, redeem/earn iPrefer points! Beautiful oceanfront location with direct beach access. Close to restaurants and shops. 190 rooms spread over 26 floors all feature a private balcony and floor-to-ceiling windows with either an ocean or bay view. 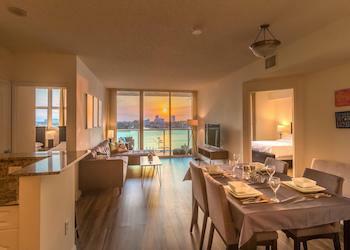 One and Two-bedroom suites available, include a full kitchen and sitting area with a sofa bed. Apartments and vacation rentals are great options for families or for groups traveling together specially if staying for more than a handful of days. You have the extra space and convenience for preparing small meals or snacks. 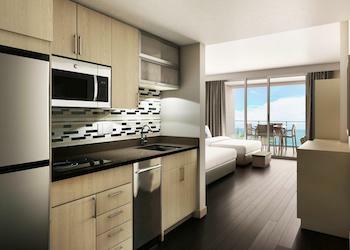 Sunny Isles is in the midst of a real estate boom and there is certainly no shortage of condos and apartments. One thing to be aware of is that this area is home to a large Russian population. Many properties cater and are staffed and run by Russians and English is hardly spoken, communicating with staff can be troublesome at times but for the most part it is not that big of a problem.